When the motorcycle was invented they said “cool.” When the BMW “boxer” engine was created they said “awesome.” Both cool and awesome have been used to describe what Suprine Machinery is going to show us at Bob’s BMW on July 13th, and you’ll find “exciting” applies as well. 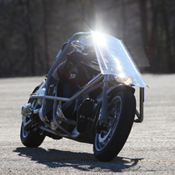 Join us to see the Exodus, a recumbent motorcycle that offers industry leading performance and ultra design. Designed to improve nearly every aspect of personal transportation, from 155+ top speed to 80+mpg fuel efficiency, the Exodus is based on Suprine’s concept of the “SPV”, the “Single Person Vehicle.” Suprine has discarded the traditional “horse-and-rider” approach to the motorcycle and has produced a two-wheel mid-engine design similar to what we see in Formula 1 auto racing. Suprine has combined many standard BMW parts, including a BMW 1200cc four-cylinder engine, with a bucket seat 7″ above the road, to create this never-before-seen ultra machine! The public is invited to join us at Bob’s BMW Motorcycles on July 13th to experience the Exodus in person and meet several representatives from Suprine. Patrons wiil be able to view, critique, and make suggestions before this pre-production prototype is finalized for sale. John Chelen, the Chairman of Suprine, will join us to share Suprine’s vision for the future and hear what you have to say. The machine will be on display until 3pm and Mr. Chelen will be speaking at 11am. Visit www.bobsbmw.com for more details. Visit www.suprine.com for complete details on the Exodus including pictures, video, and more.